The Big Idea: Practice kindness by showing gratitude. A little bit goes a long way! Having gratitude is an important part of being kind and empathic. 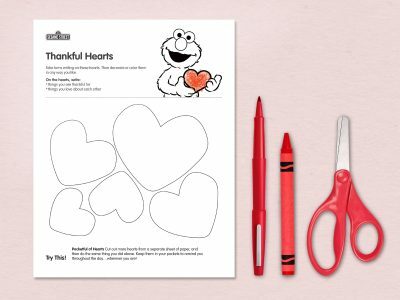 Share your gratitude for each other with a simple, relaxing art activity. Find some crayons and markers and sit with your child to practice showing thanks. On each heart, write things you are thankful for, or things you love about each other. When you’re done, encourage your little one to decorate the hearts exactly how they’d like. Put the “Thankful Hearts” on the refrigerator for everyone to adore, or cut them out to give each other.